It’s possible to have a relationship between two variables that’s curvilinear rather than linear. The Excel function LOGEST estimates a and b for this curvilinear equation. The image below shows the LOGEST Function Arguments dialog box and the data for this example. It also shows an array for the results. Before using this function, you can attach the name x to B2:B12 and y to C2:C12. The Function Arguments dialog box for LOGEST, along with the data and the selected array for the results. With the data entered, select a five-row-by-two-column array of cells for LOGEST‘s results. From the Statistical Functions menu, select LOGEST to open the Function Arguments dialog box for LOGEST. In the Const box, the choices are TRUE (or leave it blank) to calculate the value of a in the curvilinear equation or FALSE to set a to 1. Type TRUE. The dialog box uses b where you can use a. No set of symbols is standard. In the Stats box, the choices are TRUE to return the regression statistics in addition to a and b, FALSE (or leave it blank) to return just a and b. Type TRUE. Again, the dialog box uses b where you can use a and m-coefficient where b was used. Important: Do not click OK. Because this is an array function, press Ctrl+Shift+Enter to put LOGEST’s answers into the selected array. The image below shows LOGEST’s results. They’re not labeled in any way, so the labels are added for you in the worksheet. The left column gives you the exp(b) (more on that in a moment), standard error of b, R Square, F, and the SSregression. The right column provides a, standard error of a, standard error of estimate, degrees of freedom, and SSresidual. LOGEST‘s results in the selected array. About exp(b). LOGEST, unfortunately, doesn’t return the value of b – the exponent for the curvilinear equation. To find the exponent, you have to calculate the natural logarithm of what it does return. 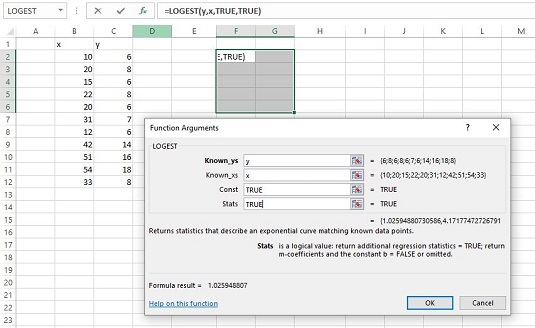 Applying Excel’s LN worksheet function here gives 0.0256 as the value of the exponent.